One of my most favorite proteins to work with is fish, but living inland finding good, truly fresh fish was a challenge, until the Saltwater Markets opened in Clover, SC and Gastonia, NC! Just take a look at Saltwater Market’s Facebook page, Clint Boyd’s excitement at opened boxes of top notch fish especially flown in shine through; these guys really care about getting you good product! For this segment, Saltwater Markets supplied me with the most amazing local fish you never heard of, Wreckfish; so called as this deep-water fish is found far off shore in it’s habitat of shipwrecks and gullies. With a firm white fish similar to grouper, and a mild taste, this was an outstanding choice for the fish kebabs. Of course any firm white fish will work should this particular kind not be around. A wrap of prosciutto retained the moisture of the fish on the grill and imparted a touch of saltiness. 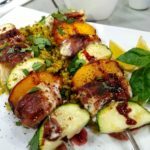 Threaded with peaches, zucchini, I finished the kebab with a Za’atar spice blend, and an easy pomegranate glaze. See the replay of this dish being made live on Fox46 Charlotte here! Any firm white fish will work well in this recipe; wrapping the fish in prosciutto retains the moisture and adds a lovely crisp; the sweetness of late summer peaches and a pomegranate glaze are the perfect finish. Place the juice in a small saucepan, and simmer until reduced down to 1/3 of volume. Whisk in the rest of the ingredients and set aside. Wrap each piece of fish with a piece of prosciutto. 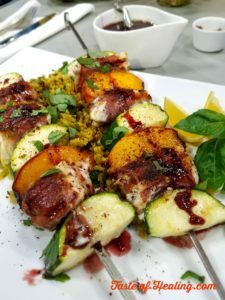 Thread the ingredients onto the skewers, alternating fish, a slice of peach and zucchini, approximately 3 pieces of fish per skewer. Brush each skewer with a little olive oil and season with salt. Remove from the heat and sprinkle with the Za-Atar seasoning. Drizzle with the glaze and scatter over the basil leaves. 'Healing never tasted so good’ is the slogan at Taste of Healing in Fort Mill, SC. 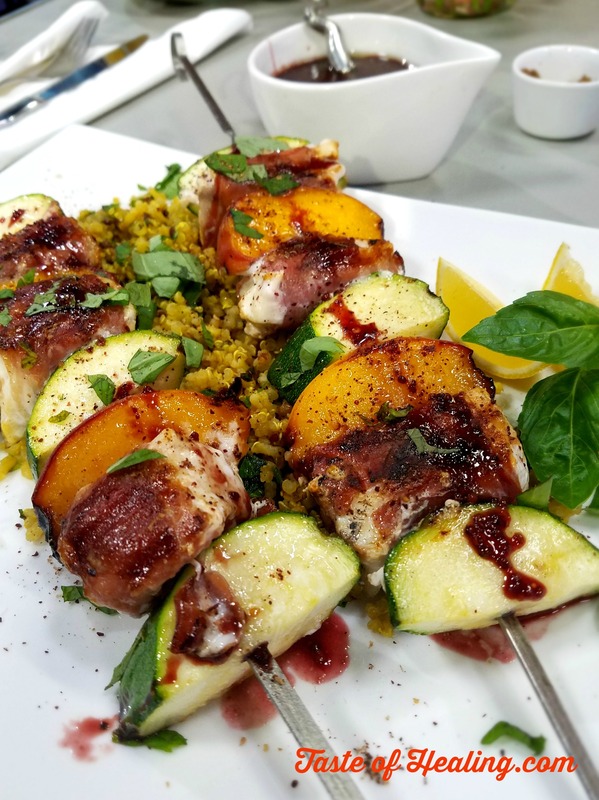 This morning, chef and nutritionist Carol Green is in the FOX 46 Charlotte kitchen teaching us how to do a prosciutto-wrapped fish kebab with peaches & pomegranate glaze on #GoodDayCharlotte. ← Cooking at Thames Farm; Healing Never Tasted so Good!